Superdry men’s Axis padded jacket. 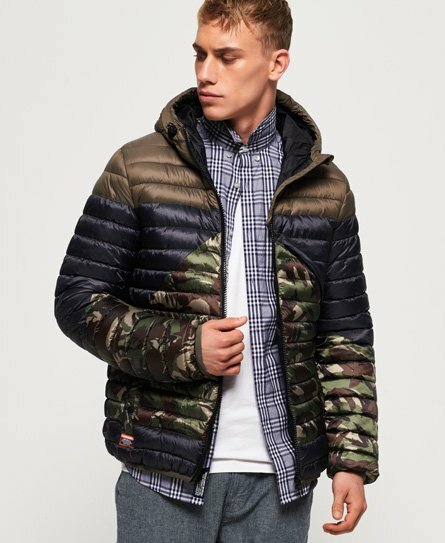 Update your outerwear collection with an iconic padded jacket inspired by Mountaineering wear. It features a single zip fastening, two popper pockets, elasticated cuffs and a bungee cord hood. For the finishing touches to this stylish jacket, it has a Superdry badge on the sleeve and a Superdry patch below the pocket. This is a great multi-purpose jacket for the new season, wear it out with jeans and trainers for a casual, on trend look. Or if you are wanting to dress it up, pair this jacket with trousers and military boots for the complete outfit.